Some of my favorite outdoor books are nothing more than the author going back through many years of his or her journals and chronicling the details of their days afield, then taking those same adventures and sharing them with like minded folks. George Bird Evans classic Grouse & Woodcock in the Blackwater/Canaan is a prime example of this type of writing. My Mountain Grouse is another clear example of why this style of writing is so enjoyable. Each chapter essentially takes the reader back in time, on a short hunt the through mountains of Idaho. Craig does a superb job of describing the sights, sounds and smells of the hunt, enough so to make you almost feel as though you are actually taking part in the adventure. But what really impressed me most about this book was that in almost every chapter the author was accompanied by one of his three sons, or if not all of them. As a father of three boys I understand the difficulties and the hardships involved in taking your children hunting with you. The desire that we as fathers have, in wanting our children to succeed and to enjoy the hunt as a much as we do is ever present, but in the end all we really want them to do is enjoy spending time with us. It is more than obvious that Craig has gone to great lengths to ensure that his boys had a good time when they were with him afield. By far my favorite part of the book was when Craig was telling the story of his son Matt's first bird. In bird hunting, a young man’s first bird is always special and to be apart of that even if only vicariously is something to be treasured. This book is full of moments like this and I am confident that the reader will love each and every one of the boy’s firsts. My Mountain Grouse wouldn't be a grouse book however, without grouse and grouse dogs. 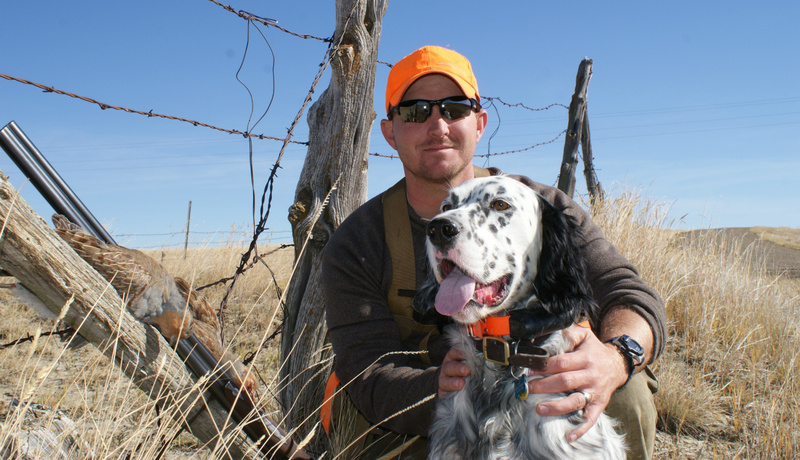 Like myself, the author has a love for classic setters and throughout the book these noble gun dogs pursue the Blue, Ruffed, and Franklin Grouse that occupy the beautiful mountains outside Boise Idaho. Blue Grouse are one of my favorite birds to hunt and there is no shortage of action in this book when it comes to gunning these birds. If you are a fan of Blue Grouse, then this is a book you will no doubt enjoy thoroughly. In addition to Blues there is plenty of dog work on Ruffed and Franklin Grouse as well. I have never hunted either of these birds and the wonderful photography that is showcased throughout the book does a great job of helping the reader understand the type of terrain that he or she will encounter when pursuing these grouse. The book is also filled with several of Craig's journal sketches that to my eye are very much like the style and flow of the sketches of George Bird Evans and are almost as enjoyable as the writing itself. All in all, My Mountain Grouse is a transfixing memoir of a man’s upland adventures with his three sons Matthew, Nathan, and Kip and their ever-present companion gundogs. It is an adventure that any upland enthusiast would be sure to enjoy.